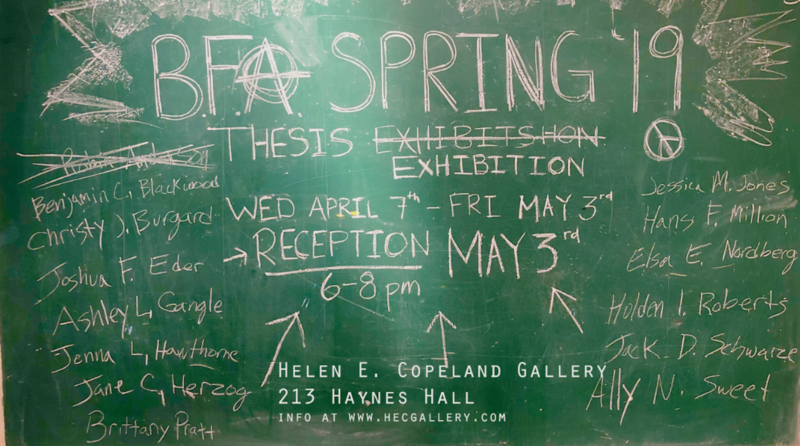 The School of Art at Montana State University is pleased to announce the opening of the 2017 Fall BFA Thesis Exhibition at the Helen E. Copeland located on the second floor of the School of Art in Haynes Hall, Bozeman MT. The show will be on exhibit Monday, December 4th – Friday, December 15, 2017. The Public Reception is Friday, December 15th from 6:00-8:00 p.m. and will be free and open to the public. Hors d’oeuvres will be served, as will a cash bar. On view will be the thesis works of six emerging artists graduating with their Bachelors Degrees in Fine Art. A number of disciplines will be represented: drawing, painting, printmaking, ceramics, and sculpture. The following students will be in the exhibition: Nettie Davis, Melissa Dawn, Hayley Drury, Raechel Haverstick, Lindsey Redmond, and Bradly Strock. For more information on this exhibition, or on the Helen E. Copeland Gallery in general, follow us on Facebook (http://facebook.com/msuhecg).